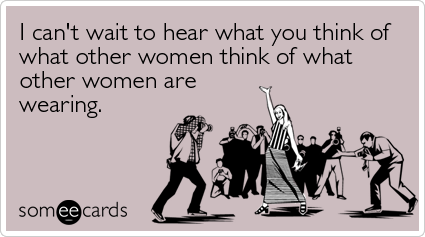 And, contrary to the general spirit of someecards.com, I mean it sincerely! A week where you have to work over a holiday is never the best, especially when it’s a particularly sad case. But rejoice, minions, because Sunday is that special night where we curl up in pajama pants, eat snack food, and get judgey about sartorial choices: the Small Dog Annual Oscar’s Gown Rundown (fifth installment now…yikes) rides again! Will legs pop out of their sockets and get their own Twitter accounts? What trends will cause the most hand wringing/adulation? Will Peregrine ever forgive me for hating on Louis Vuitton last year? Tune in! Much needed I feel. Margot always uses a certain symbol in her online interactions when she’s being sarcastic to avoid misunderstandings, which seems to help. You couldn’t pry my emerald engagement ring from my finger if you tried, but I think that any of these would make stunning wedding rings. Eclectic but somehow classic, I feel, and gorgeous! Shoots like this undoubtedly give me unrealistic expectations of future London living, but it’s pretty all the same. I also follow her blog [Aspiring Kennedy] and she’s got excellent travel tips and adventure tales. Hilary Mantel, author of Wolf Hall and Bring Up the Bodies, both of which I highly recommend takes on the sanctity and vulgarity of royal bodies our our fascination with them. Cats – walking across keyboards before there were keyboards. I find this utterly charming. Interesting perspective on how Americans lean politically and why. Minions are expected to report for judging (others, of course, we’d never judge you, dears) on Sunday night. Here’s some homework in the meantime. The (semi, at this point) weekly sheep. Lazy, naive, sentimental, thoughtful. I’m so confused… Of course I wish Admiral Ackbar had been there to warn me about Lazy right there at the top. Passionate, witty, peaceful, charismatic. If only!